Having Namine’s new walker is certainly a blessing, but it’s still a little too big for her. 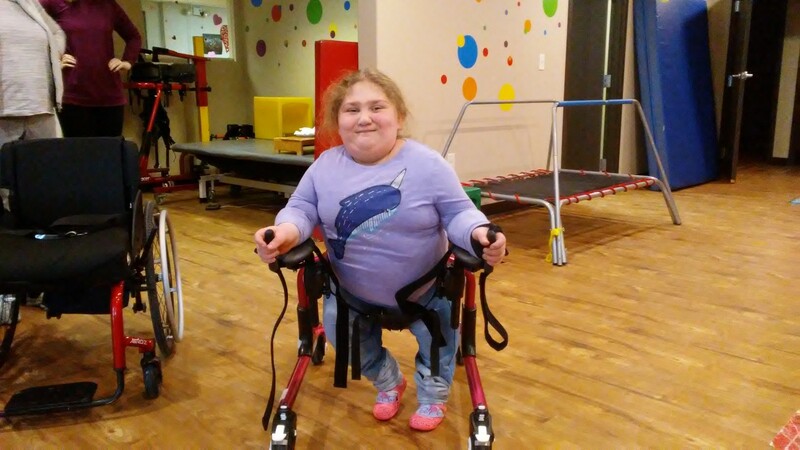 She’ll grow into it, but in the meantime, her therapist is having her go back to using her old walker in physical therapy. With her old walker, Namine had to hunch over because it wasn’t tall enough to provide a good armrest height. The new walker, being taller, is good in this regard. However, it’s also wider, which means that Namine has to spread her arms out farther in order to place them on the armrests. The upshot of this is that she isn’t able to maintain the same leverage she has with her old walker, making it harder to walk. In the long term, we need to wait for Namine to grow a little more into her new walker. In the meantime, however, her therapist has provided Namine with armrest attachments, which extend the height sufficiently enough that Namine can stand tall in her old walker. They’re not ours to keep, and Namine can only use them while at therapy, but it’s a step (ha) in the right direction.